Join us for a celebration of Spring, and an evening of beautiful flowers, before we open the market for the season! At our Spring Soiree we'll feature our favorite new annuals and perennials of the season, and highlight butterfly and bee attractors. 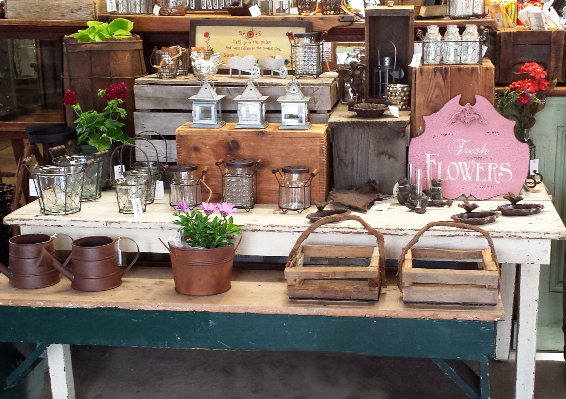 Browse garden gifts and Spring decor in our market, and special displays in our greenhouse. Light refreshments include Cider Punch, Cherry Dessert, Cheese and Fruit Board, Iced Tea, and Product Samples from the market. Door Prizes throughout the night will include a Hanging Basket, Perennial Trio, and Fruition Seeds Packets! 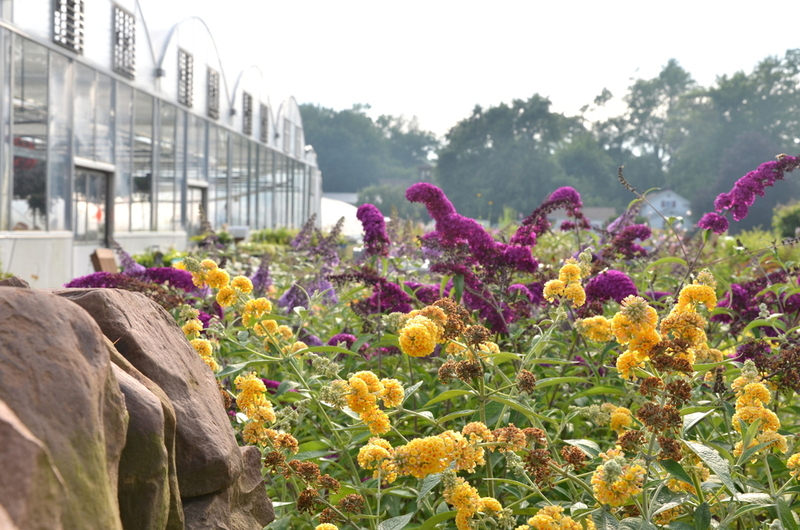 You're invited to tour the greenhouse with Tim Kirby, as he explains our IPM program! Did you know we put special insects to work for us in the greenhouse? Learn how certain beneficial insects help us control pests. Grower Tim Kirby will introduce you to our tiny friends, and explain how this ecosystem works. Tours begin at 7, 7:30, and 8. We’re hoping to see lots of familiar faces to help us start off the new season, and plenty of new ones too! The Greenhouse is Coming Alive! After just a few days, the empty metal and concrete structure of our Big House is filling up with tiny green life! Tim Kirby transplants tomato seedlings while Kaisa and Stephanie plant hanging baskets in the background. Bay 2 is filling up! The five gallon patio tomatoes have a great start. By May they'll be over two feet high and loaded with plenty of blossoms, green fruit, and some ripe tomatoes. A few of the hundreds of hanging baskets we grow, ready to be planted. Tiny superbells are snug in their new homes. If you've ever visited our greenhouse in May, you know how spectacular they'll look in just a few months! This is such a beautiful and exciting time of year! Summer and Fall merge, in a glorious display of color. 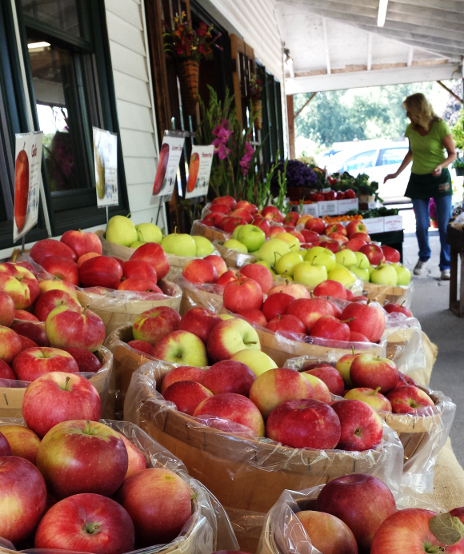 You can find pumpkins, strawbales, gourds, apples, and apple cider at Kirby's. A great start to the Fall season! 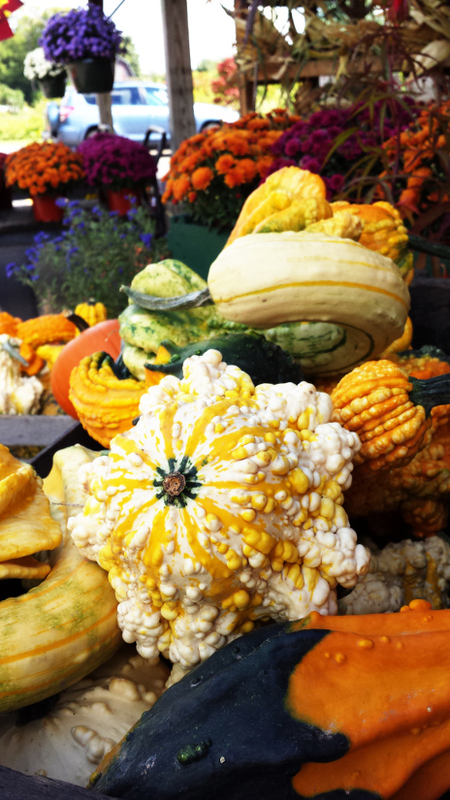 This giant gourd variety grows into some very interesting shapes and colors. 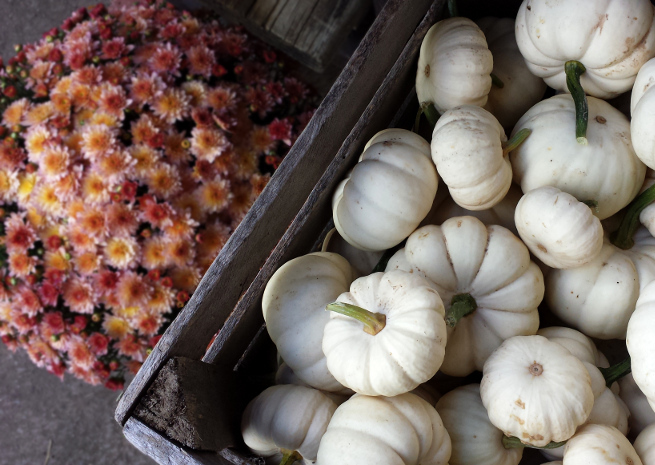 Little orange and white pumpkins are adorable, in just as many shapes and sizes. 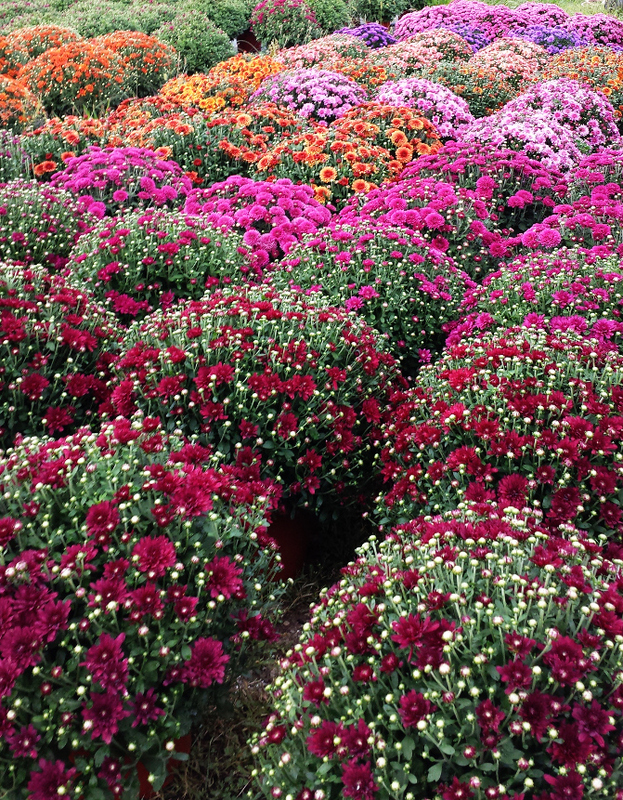 Our large Mums are exploding with color! And there are a lot of colors to choose from. Complement your mums with some interesting foliage plants from our perennial area. Perennials are all 25% off! Tomatoes are at their peak, while peaches are beginning to come to a close. 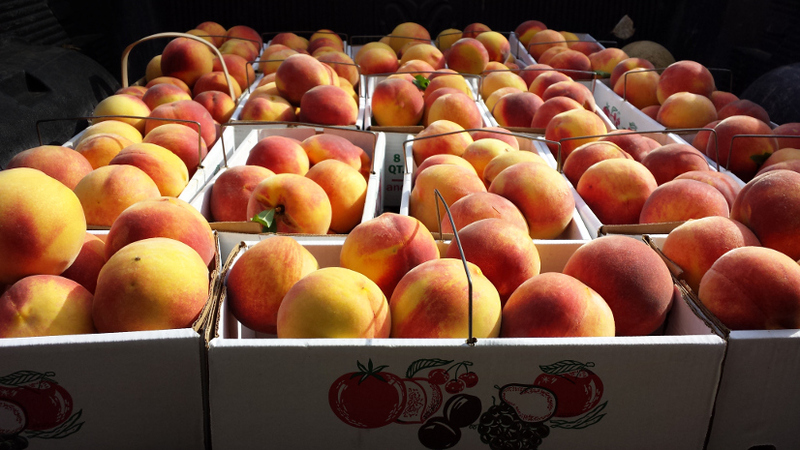 Right now we have Cresthaven peaches, which are a freestone variety that's excellent for baking, eating, freezing, and canning. We also Babygold, a clingstone variety that is our personal favorite for canning. They have excellent flavor, you don't have to peel them, and their firm flesh holds up well in a jar. Sweet and Hot Peppers, Eggplant, Lettuce, Kale, Beets, Broccoli, Garlic, Cauliflower, Plums, Pluots, and Nectarines. A Perennial sale this big is a rare occasion at Kirby's, but we're ready to move out our older plants to make room for new and interesting perennials! Wander around in our perennial area and you'll find dozens and dozens of pots with bright orange or pink stickers on them. If the pot has a sticker, it's 50% off! Our Perennial of the month is also 50% off, Amsonia hubrichtii! This beautiful and graceful perennial is a native plant. 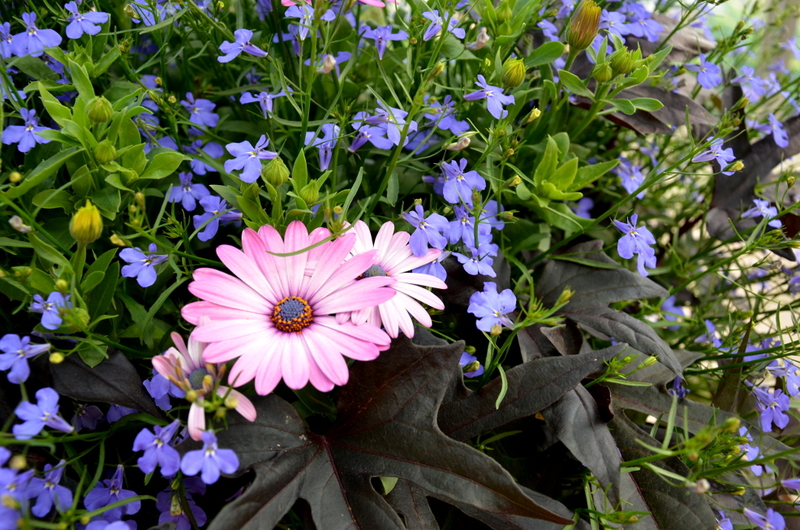 Long lived, bug and pest free, it’s flowers emerge in May and June with clusters of steel blue. The long narrow leaves give the plant a look of a bottle brush that turns to a golden yellow in the fall. If you're looking for deals, be sure to check out the clearance perennials, found in the last row in our perennial area. Finding the perfect plant for your garden can be overwhelming, when faced with hundreds of choices at a garden center. This season we're inviting you to join our Perennial experts, Jaime and Judy, for an informative stroll around our perennials. They'll highlight some of their favorite plants, give helpful hints on how to navigate our perennial area, answer questions, and give suggestions for your garden. Come by every Wednesday, Saturday, and Sunday in May, at 10:30am or 2pm, and learn about beautiful perennials for your garden! 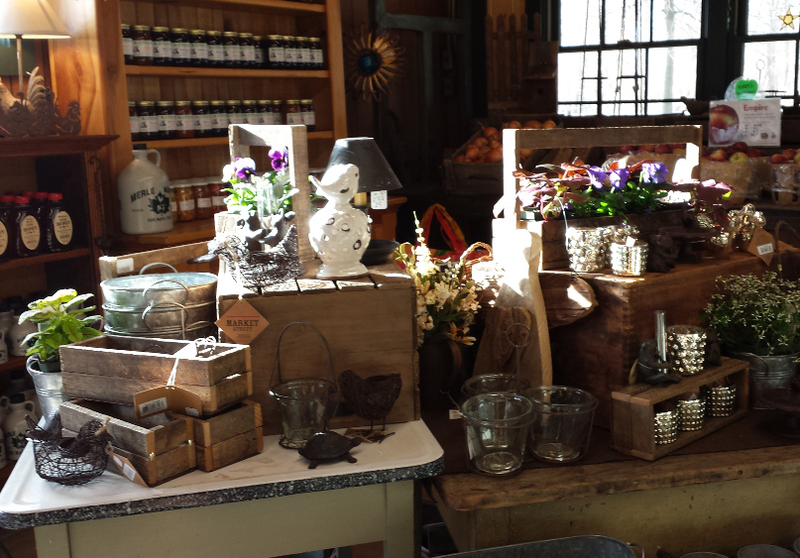 We have a bunch of new things in our gift shop this Spring, and so many perfect Mother's Day gifts. 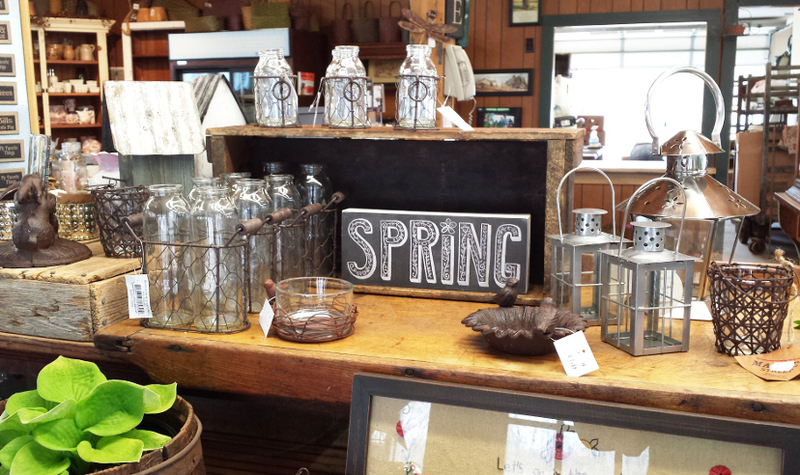 These rustic bottle vases are a lot of fun, and we ordered a huge variety. Single double or triple, tall or short. 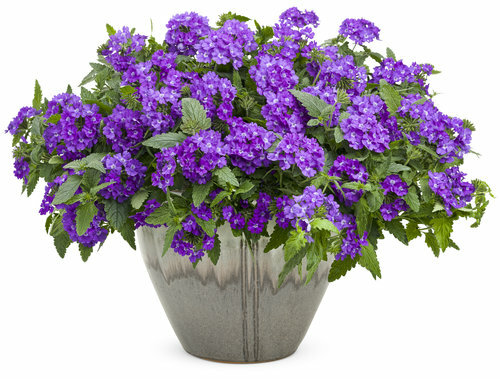 They're perfect to add a little cheer to any corner of the house, with a single flower or a small bouquet. Or, if you'd like to take a break from the usual flower arrangement, just pick out a container (shiny, rustic, or wooden) and plunk a beautiful plant or two inside. Our greenhouse is full of pretty and interesting plants, with lots of color and texture to choose from. You've made a little bit of instant beauty that Mom can enjoy as a centerpiece, and then plant in her garden to enjoy all year. We also have tools and gardening gloves for the avid gardener. If you really know your gardener Mom's taste in plants, there are some gorgeous perennials in bloom right now. Bleeding Heart, Garden Phlox, Tiarella, and Brunnera are a few colorful examples. Or you could go with green and pick out a hosta or fern from our collection. Are there just too many choices? Gift Certificates from Kirby's are a very popular Mother's Day gift. It's a lot of fun seeing them come back through the rest of the year, exchanged for plants, fruits and veggies, baked goods, jams, or a fun home accessory. 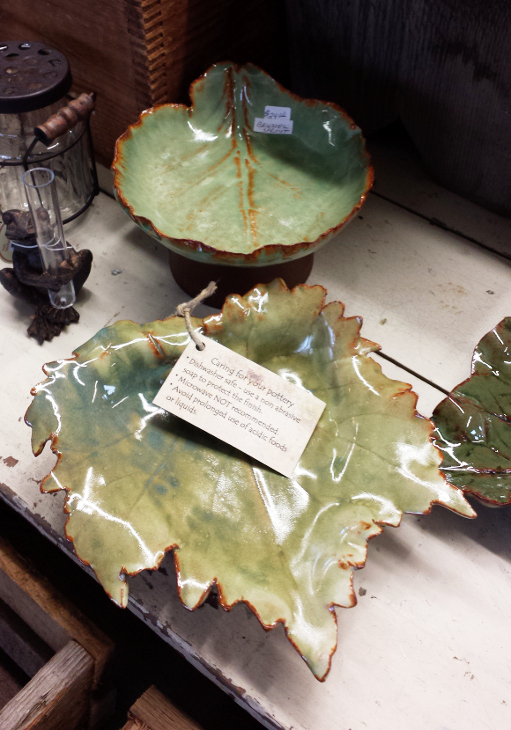 A few more gift ideas for Mother's Day: Dishes and bowls from local potter Rose Vantyne; battery powered candles; pretty mugs and bowls; or votive holders with a locally made soy candle from Sandy Creek! On a drive around the farm today, beautiful signs of Spring were everywhere. The apricot trees are the first to flower! We had a cold start to the season this year and there will be a slight delay because of it. Even for cool weather crops like peas, you have to wait for the soil to warm up enough before you can put seeds in the ground. 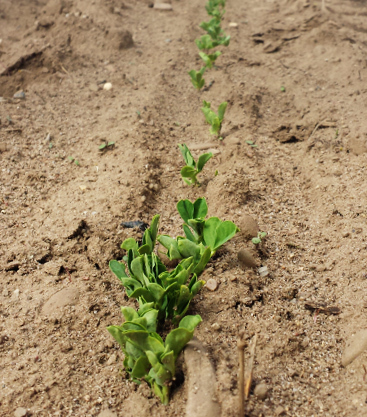 For the past two years, peas were planted in the first week of April, but for 2014 they weren't in the ground until the third week. Although this is closer to normal, it does mean that we'll have to wait a little longer for those delicious green pods to make an appearance. When the forsythia blooms, we know it's time to rake the insulating layer of straw off of the strawberry plants. The sooner their green leaves can bask in the warm Spring sunshine, the sooner we can bite into a sweet, red, strawberry. This is the earliest broccoli has ever been planted at Kirby's. Thousands and thousands of plants were seeded. Starting in June, broccoli will be harvested every week until cold temperatures kill the plants. We're in for another epic year of broccoli! Last year we all enjoyed a phenomenal peach crop - we just about had more peaches then we knew what to do with! Unfortunately, it looks like this year we'll be lucky to find a peck basket in the entire orchard. It’s sad news for us, and our customers. Luckily many of our other stone fruits weren’t hit as hard; it looks like the plums, prunes, and apricots will be bearing a normal crop! You might remember a few days this past winter, when the temperature dropped to -11F. That was too cold for the tender young growth of the peach trees to survive. 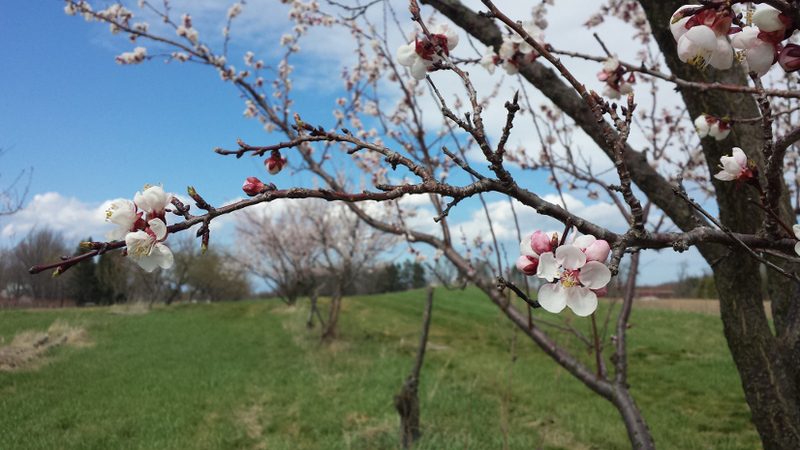 The trees themselves weathered the winter, but those young buds are the source of this season's peaches. If you're wondering how we can predict the yield for a crop that won't fruit for months, there is a simple way to find out if your blossoms will turn into fruit. Sometime in April when the buds on the trees are just beginning to break out, Tim Kirby cuts a handful of small branches. He sticks them in a bucket or jar and keeps them in a warm place. The buds will open enough to reveal the flower. With the help of a magnifying glass and a small knife, you can see whether the inside of the pistil is black or green. A black heart is a sure sign that the fruit doesn't have a chance. Thanks for reading! We know our customers like to stay informed of how the weather is effecting the crops, and how the season is coming along. For the rest of the year, we 'll post a Field Update on the first and third week of the month. See you soon! Walking in the greenhouse today, I saw little bits of color everywhere. So I picked a little photograph bouquet! I hope you like it! So far, April is a welcome contrast to March! Those patches of snow will be gone soon enough, with weather like we had yesterday. The greenhouses are warm and humid, especially when the sun shines. Yesterday, the skies were clear all day and it got down right HOT! The smaller houses were opened up to let out some of the hot air, keeping the perennials cool for a little longer. But in the big house we're keeping things toasty warm, and the annuals are growing like crazy. 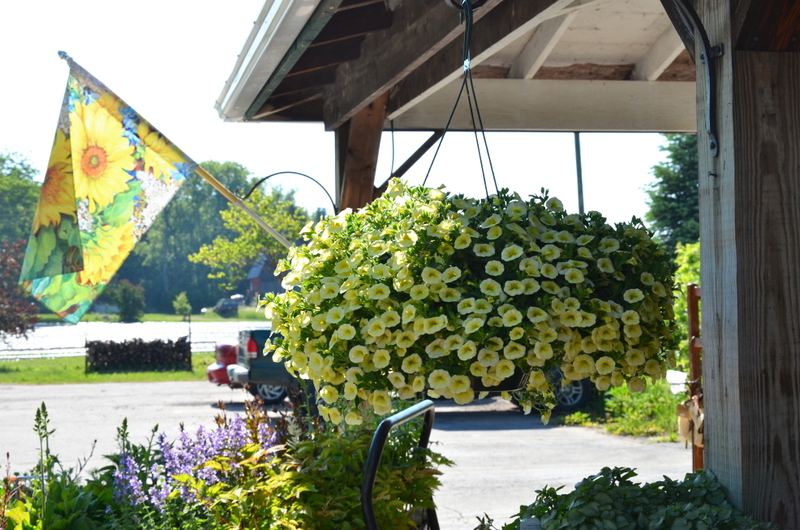 Hanging baskets have already doubled in size, and we're starting to see some color here and there! When we open our doors on May 1st, the difference will be amazing. Less then a month away! It's a sad day, as we say goodbye to garden impatiens. If you have a shade garden, you've probably heard of or experienced the issues that Garden Impatiens are having in our area. Did you have a patch of impatiens that wilted and died no matter what you did? Powdery Mildew is most likely the culprit. First, Powdery Mildew causes the leaves to yellow. Then the flowers drop, and soon there's nothing but sickly stems where your beautiful impatien was growing and blooming. Powdery Mildew was first spotted in Minnesota in 2011, and has since been found in 32 states, including New York. It spreads through the soil, water, and it will even travel hundreds of miles through the air. Once your garden or plants are infected, there's no way to get rid of it. A similar downy mildew that effects Sunflowers remains in the soil 8-10 years after infection. This is the first year that we completely removed garden impatiens from our roster. It was hard to let go of a plant that brought so much color to shady areas! Last year we had a fraction of our usual numbers for those that were still able to grow them in the area. But after seeing how far the mildew has advanced, and how devastated gardens were by the infection, we realized it was time to try something new and say goodbye to regular impatiens. The good news is, there are replacements available. New Guinea Impatiens are the closest match. They have a similar height and growth habit, with a good selection of colors. They prefer some sun, but will tolerate full shade fairly well. The best solution might be to select a mix of annuals for your shady garden beds. Visit the shade aisle in our greenhouse for a good selection. 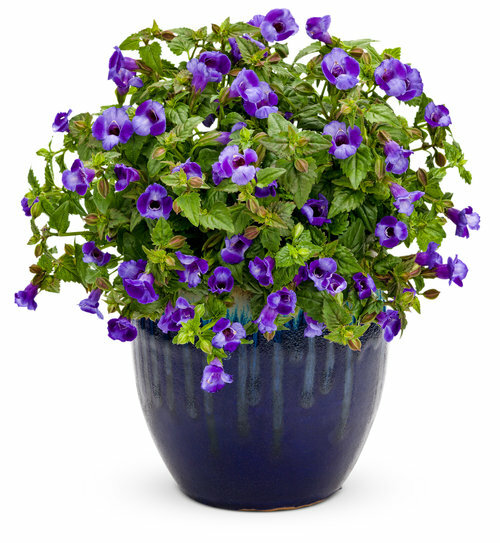 We have Torenia, a shade-loving plant that produces beautiful flowers, and attracts hummingbirds. Ajuga is a perennial ground cover for shade, with colorful foliage. Annual foliage plants like Coleus will provide color as well as some height. These are just a few examples. Ask one of our helpers in the greenhouse and we'll assist you in finding the right plants for your garden! This time of year, when Spring has barely made it's presence known, the greenhouse is an inspiring place. Warm sunshine falls on thriving green plants, and flats of sprouting seeds. One small seed placed in the soil, one of thousands transforming into tiny, tender sprouts breaking through and unfurling in the light... after a long, cold, snowy winter like the one we've had, we're all waiting for a chance to branch out in the warmth! 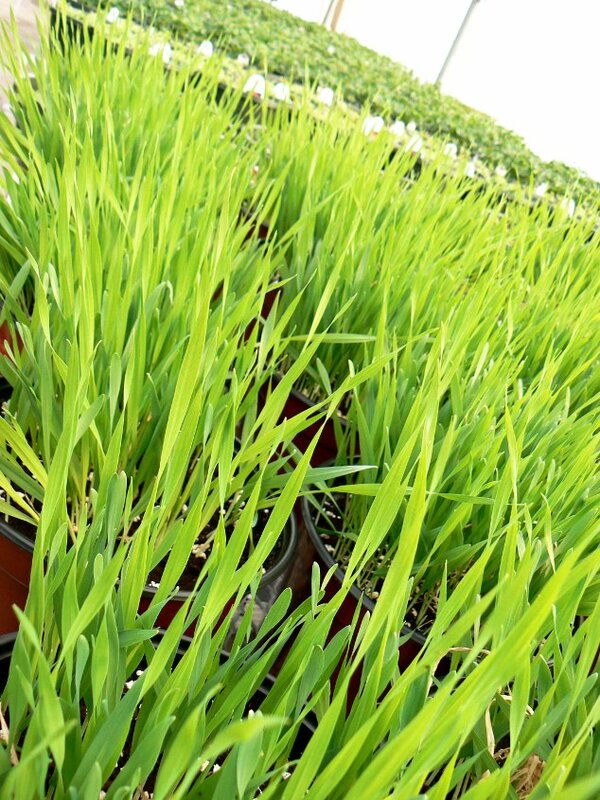 We start our plants by seed, plug, or bare root transplant depending on the type of plant. Vegetables destined for the field are started from seed (tomatoes, peppers, brcooli, etc), as well as enthusiastic annuals (marigolds, allyssum, lobelia, for example) and perennials. The photos below in the center and on the right show our broccoli seedings. Every two weeks, another crop will be transplanted into the field, giving us a constant supply of broccoli from June until November. 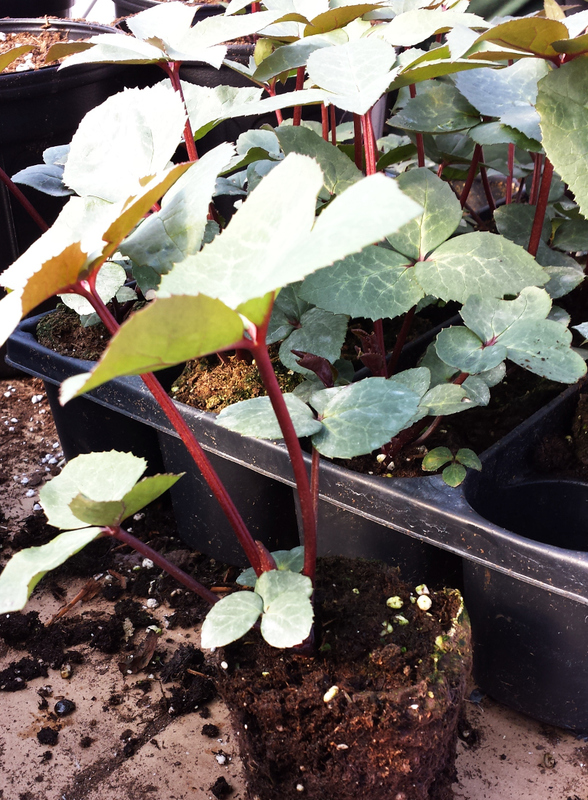 Most perennials that come in as plugs (young plants growing in trays) are planted in smaller quart pots. 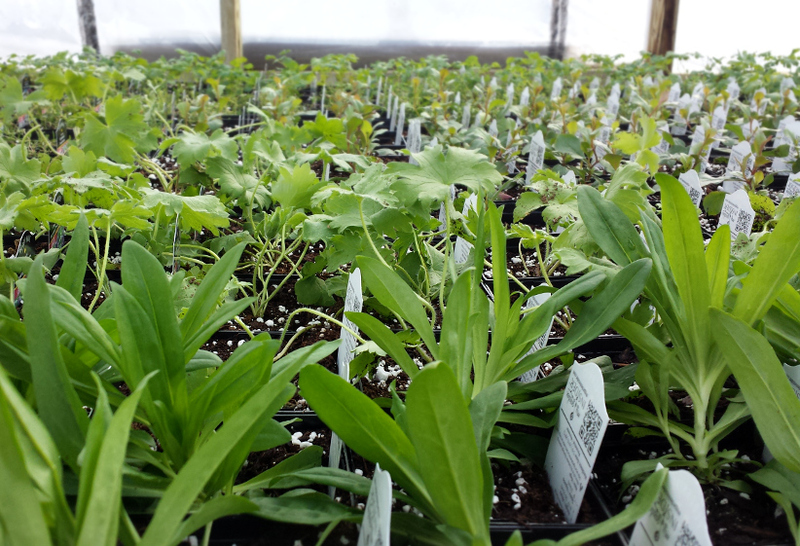 Delphinum, Columbine, and Dianthus are pictured below on the right, growing happily in quart containers. Look at that green! All bare root transplants are put in gallon pots to give these large root masses plenty of room for an equally large plant. Some particularly vigorous plugs like hosta and helleborous are planted in larger gallon pots as well. Pictured to the left, for example, is Heleborous Ivory Prince with striking red stems and graceful, blue-green leaves. 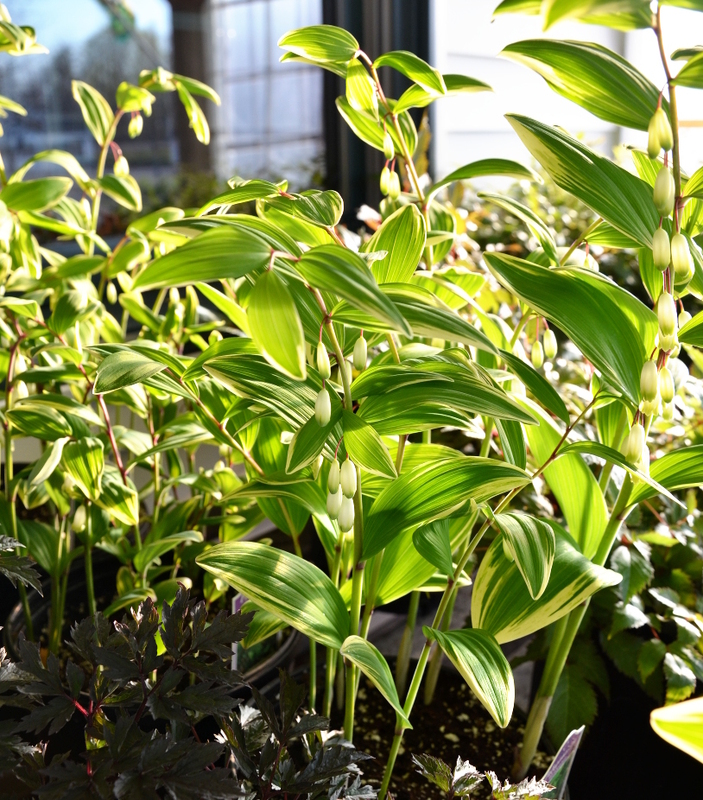 Below on the left and in the center is Hosta Sum and Substance, one of the largest hostas on the market. It grew so well in the tray that they were impossible to pull out and we had to cut the tray to pieces! Look at all those roots. To keep them from becoming root bound, we sliced off a layer of the bottom of the roots. On the right is Pineapple Lilly, an exotic looking plant with long pointed leaves and a tall flower stalk. 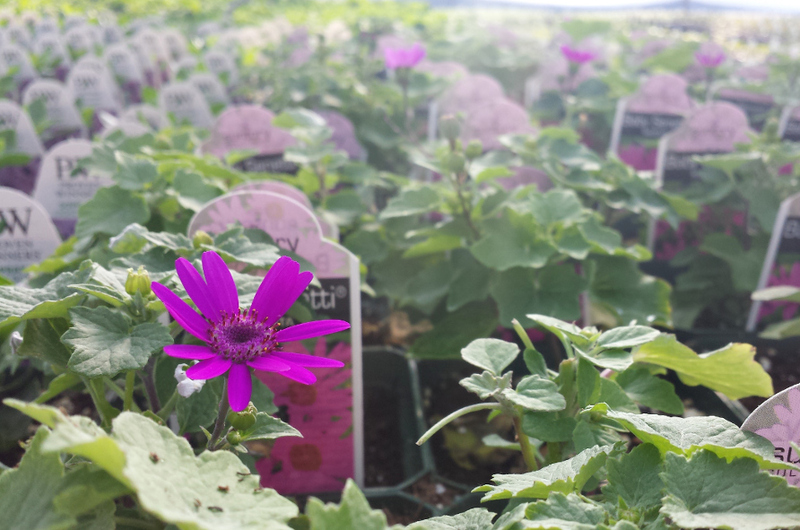 Here are a few of the new annuals we'll have in the greenhouse this Spring. They're all Proven Winners, which you can count on for easy care and "vigorous, healthy, vibrant, and unique" plants. 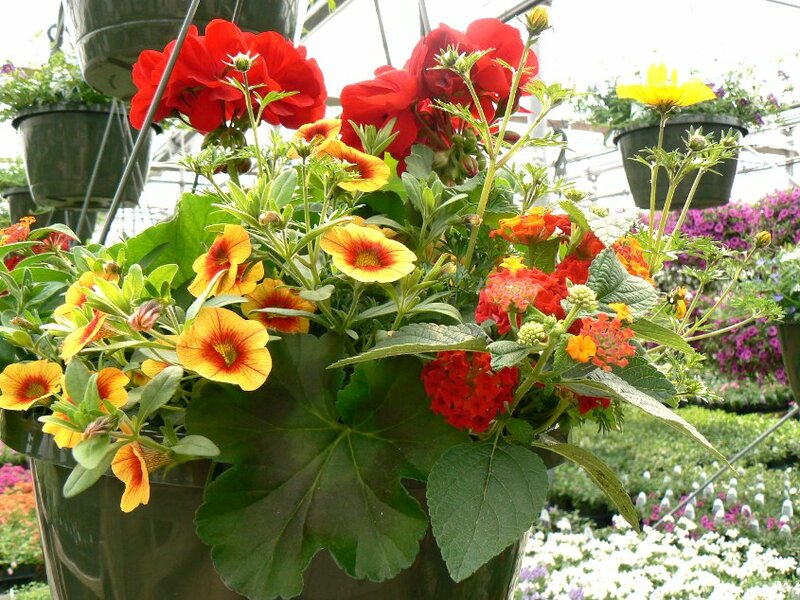 We're looking forward to trying out these gorgeous colors in hanging baskets, garden beds, and brand new combinations! We added Spicy and Pomegranate Punch to our already long list of Superbell color choices. They look pretty spectacular! Those hot colors will pair wonderfully with purples, reds, and chocolate folliage. Superbells Callibrichoa are a type of petunia with a finer foliage and many small blossoms. 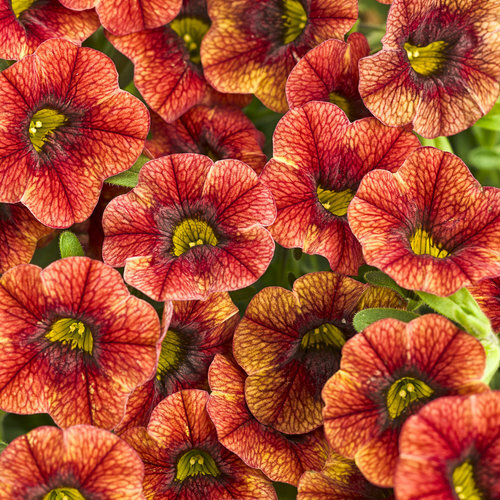 They are amazing in hanging baskets, container gardens and garden beds, and they can get very, very large! One of our favorite things about superbells and supertunias is that, unlike traditional petunias, you don't have to remove the dead flowers. They'll bloom all season long with plenty of water and regular feeding.Growing Tips: If they get too big, they do respond well to being cut back. Because of the airy habit of the plant, it's best to protect them from high winds to achieve a better overall shape.For best bloom, don't let them dry out! 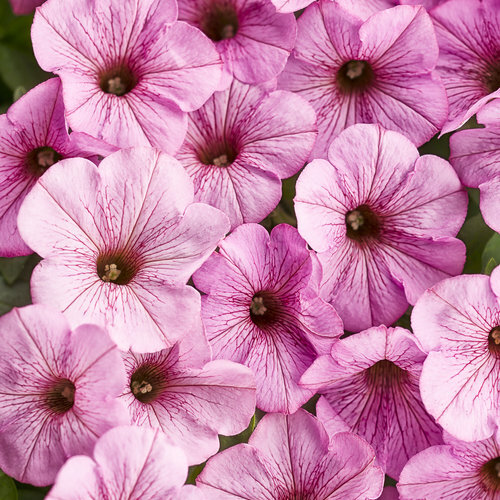 A soft salmon color with delicate veining, Flamingo is a very robust Supertunia. 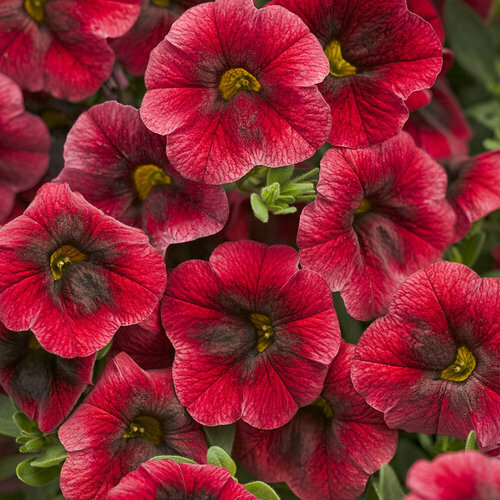 It joins the ranks of some of our favorite annuals, including Royal Velver Supertunia, Priscilla SUpertunia, and Bordeaux Supertunia. 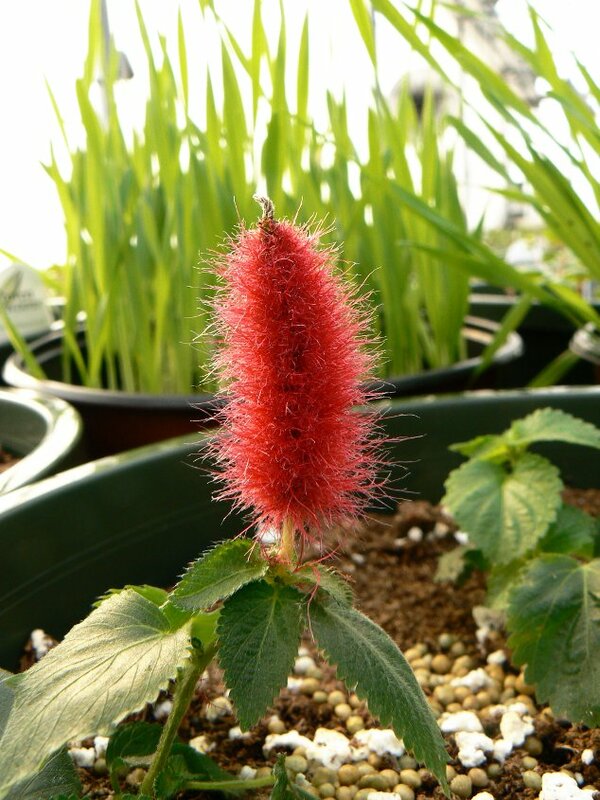 This beautiful plant has the potential to grow up to 18 inches high and two feet across! Like all Supertunias, Flamingo is beautiful in hanging baskets and container gardens. And you don't have to deadhead. It's always nice to avoid that sticky, unpleasant task! Osteospurnum, (or African Daisies) have been grown in our greenhouse every Spring for many years. 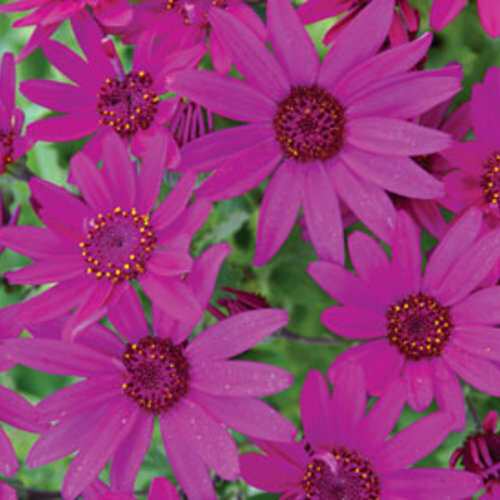 This season we added Senetti, an African Daisy with smaller, prolific flowers. The color is intense! Growing Tips: Similar to the Symphony Orange and Yellow African Daisies we usually grow, these annuals will bloom heavily in cooler weather, but will retreat in the intense heat of summer. When July comes around, be sure to put them in part shade and water often to encourage bloom. However, these beautiful flower are frost tolerant! We're looking forward to seeing what they do in the Fall. Lavender purple flowers on dark green folliage. This plant will bloom all season until frost, with proper care. Excellent in hanging baskets, containers, and garden beds, Violet Ice will also blend well with other flowers in combination pots. 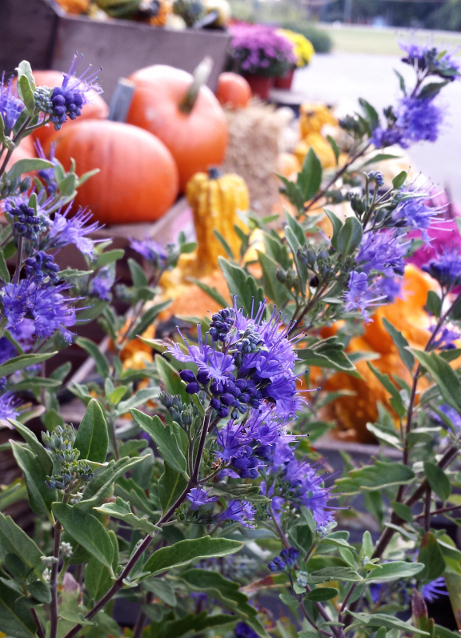 Growing Tips: Superbena are heat and drought tolerant! Expect impressive results with regular watering and fertilizing. 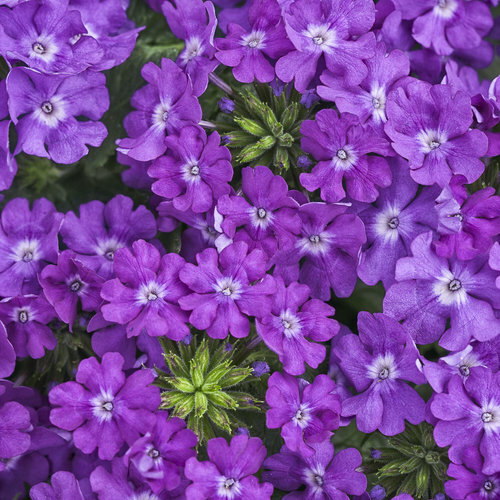 Verbena is another plant that you must deadhead, traditionally, but they were developed to avoid all that itchiness. Violet Ice will bloom for the entire season whether you remove the dead flowers or not. 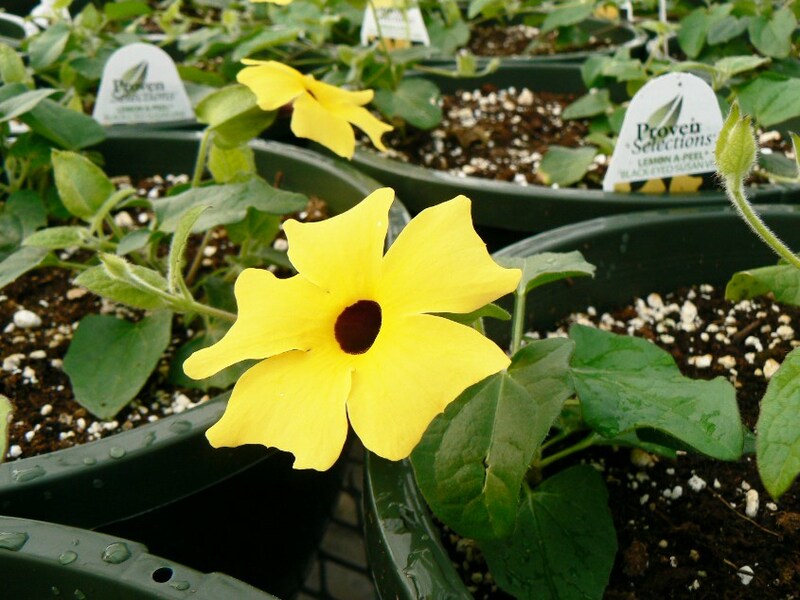 Coming Soon.... photos from the Perennial House, and new perennial varieties for 2014! I ran outside to capture these beautiful flowers yesterday, when the sun finally peeked through the rain clouds. 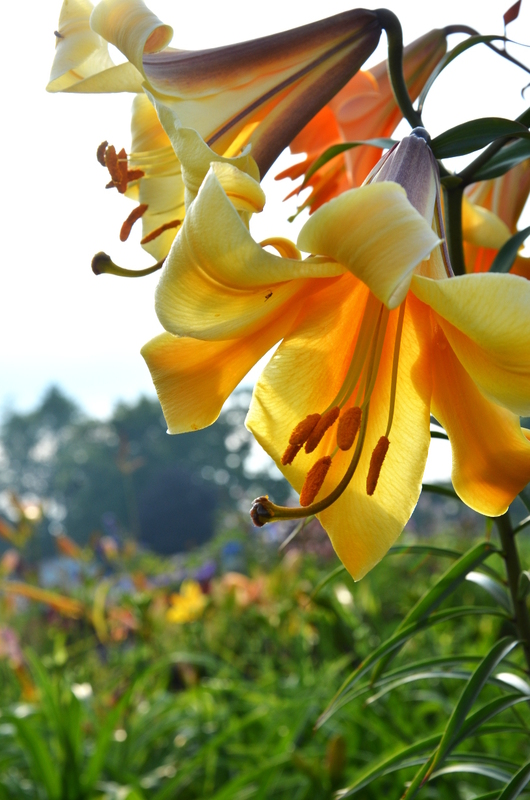 So many gorgeous varieties of lilies are in full bloom right now, along with butterfly bush, lavender, hydrangea... and many more! 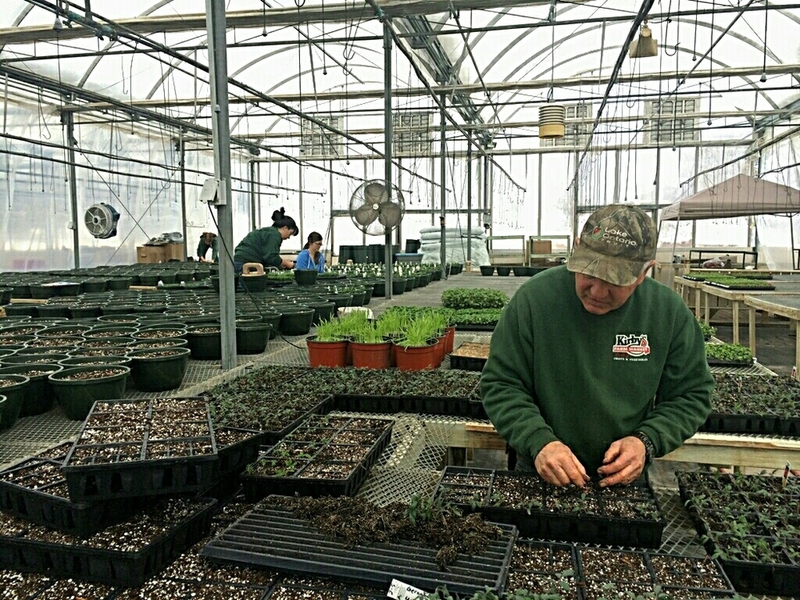 The big rush to get our gardens planted as soon as this chilly Western New York soil warms up seems to have subsided. Weekends in May can be very very busy at the market! Now that June is here, things have quieted down and there is still a great selection in our greenhouse. There are still holes to fill in gardens out there, and porches to brighten with hanging baskets. Make sure you come to Kirby's to fill them and brighten them! You'll be glad you did. Our hanging baskets are always amazing, and they're still looking fantastic. We have plenty of Proven Winners in 4.5" pots, and bedding plants in 6packs. Our combination container gardens, window boxes and hangings baskets sold great this year, but we still have a few left. 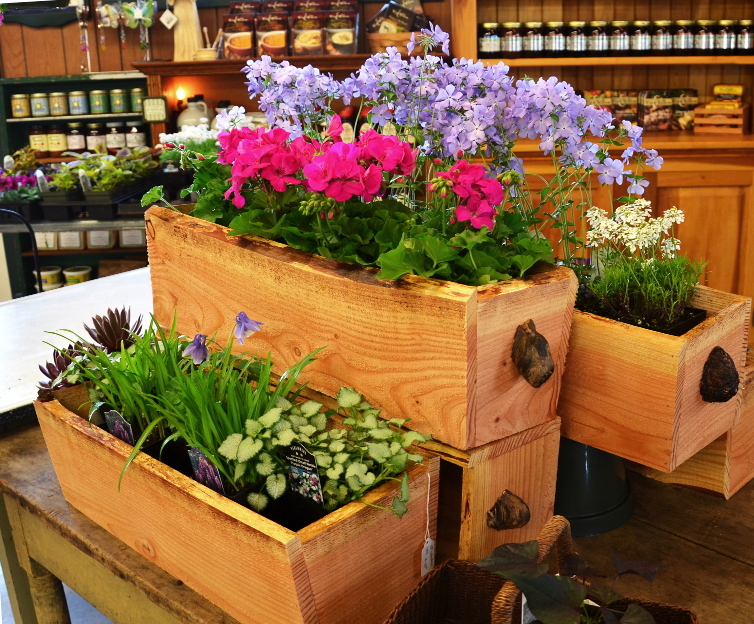 If you want to make an instant statement, these huge planters are the way to go! How are your gardens doing so far? 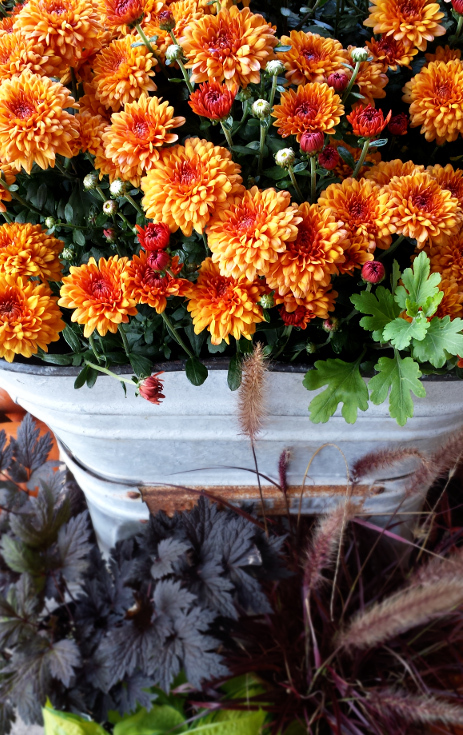 Send us a photo of your gardens and containers - we'll post our favorites on the blog! Thanks to our greenhouses, color shows on these early bloomers while green things are just beginning to poke up outside, creating a beautiful show this time of year. From left to right, top to bottom: Snowdrop Anemone, variegated Solomon's Seal, Lithodora Grace Ward, Lilly of the Valley, Wild Sweet William 'Blue Moon' in the top window box next to white Iberis, and lastly, Brunerra behind painted fern. Mother's Day is coming up! 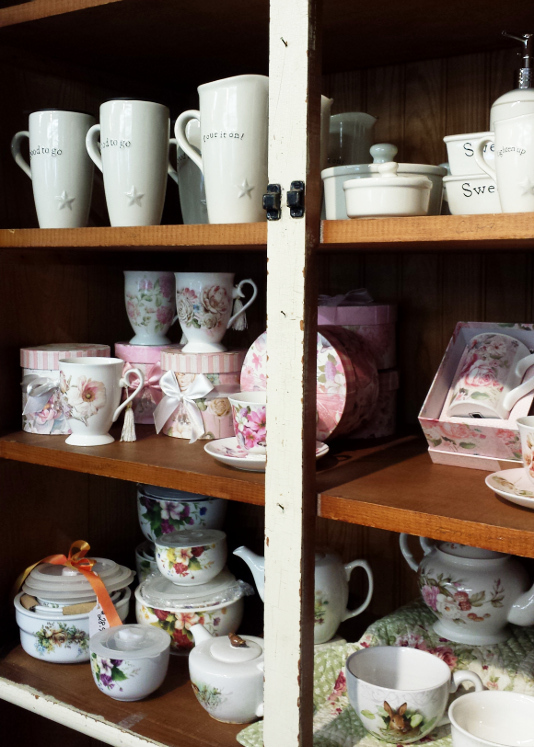 We always have a display of Mother's Day gifts set up as soon as we open, to inspire you for the holiday. 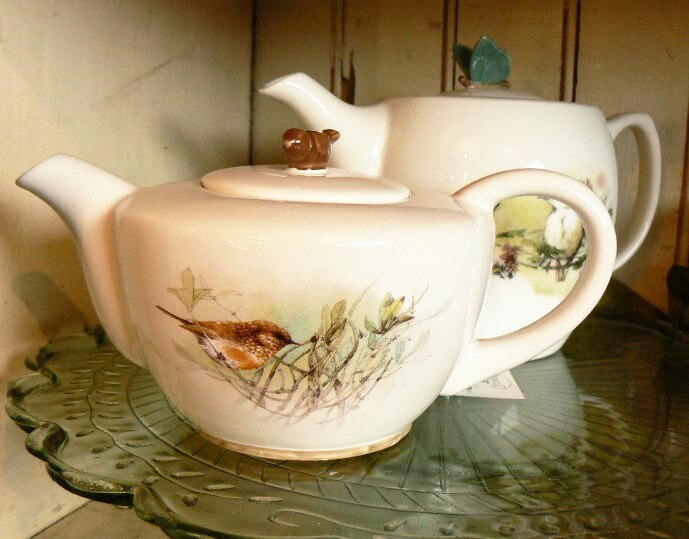 This year we have a new line of beautiful teapots and teacups in delicate floral patterns. The soft colors and feminine designs are particularly nice for a Mother's Day gift (or to add something special to your own afternoon tea!). Put it together with a tea from Tranquility Herbals (blended in Albion, NY), a colorful coaster, and maybe some local honey... and you have a wonderful personalized gift for any Mom! . By far, gift certificates are our most popular Mother's Day gift. Purchase them in any amount, and they can be used for any purchase within 365 days. Flowers for the garden, homegrown produce, Mums, poinsettias... we love seeing what people choose with their gift certificates all year long! Hanging Baskets are a very close second to gift certificates. Like a great big bouquet that can be enjoyed all summer, we have so many varieties and colors to choose from. And there's nothing quite like or combination baskets! We also have a variety of locally made gifts and treats! Stop in to see what's new from our local artisans this year. Even though the ground is still frozen (and no doubt snow will be flying before March is done) we're already seeing the first signs of Spring. With the mild winter we've had this year, green things are popping up pretty early. Have you noticed the daffodils poking through the ground? Maybe a patch of snowdrops or helleborus blooming? At Kirby's, it always gets green long before the rest of WNY thaws out completely. In our greenhouse, the first batch of hanging baskets has been planted. Happy little annuals are growing vigorously on the benches, gaining some size before we hang them up. 14 trays of onions were seeded this morning. Onions are a first for us! Farmer Tim was inspired by our CSA program to add a few new crops. He's excited about the idea of giving our CSA members as much variety as we can throughout the season. There will be more plantings of lettuce and spinach too. Our regular customers will benefit as well, when that amazing homegrown lettuce stays around for a few weeks longer then usual, and homegrown green onions and beans show up on our market tables. 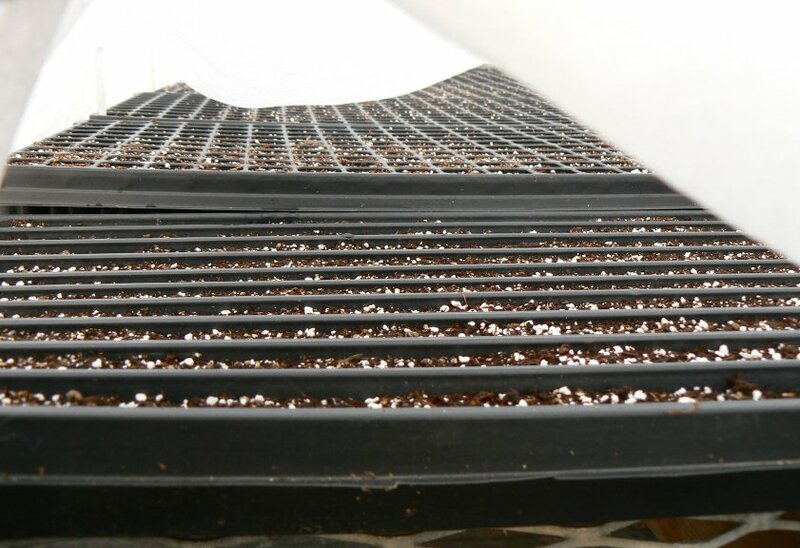 Soon there will be trays of tomato, cauliflower, broccoli, and pepper seedlings growing in the greenhouse. And before you know it, we'll be out in the fields harvesting delicious produce for your table! top by to say hello and Happy Holidays before December 24th! Handblow glass ornaments from Delish Glass in Rochester. 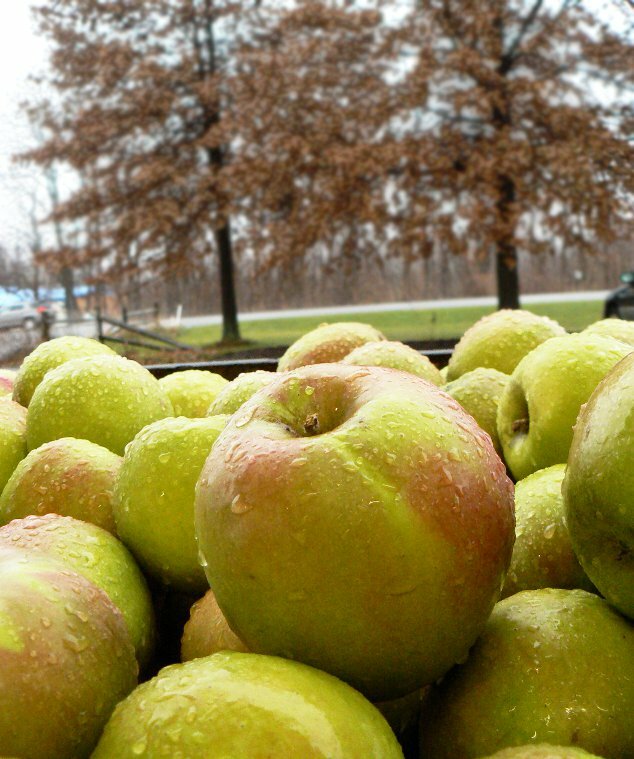 Stock up on produce like apples, potatoes, onions, and squash for the winter. Fresh picked Romanesco, the perfect Christmas vegetable! Owners Tim and Linda Kirby spend some time in the greenhouse together. 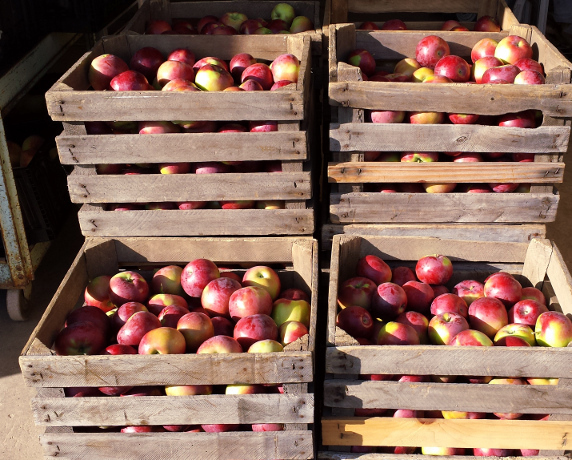 Twenty Ounce apples on special in November. Fill your own 1/2 bushel basket for seven dollars! 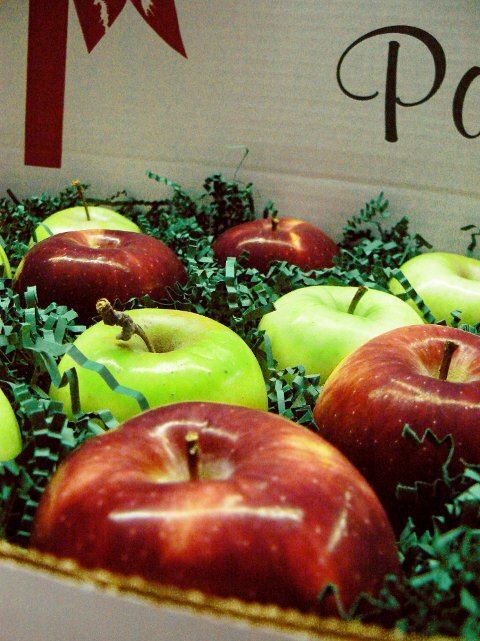 We ship apples from October 1st, until the second week in December to anywhere in the continental USA. Choose any combination of vairieties to sendas a gift or a treat for yourself. Pictured here is Empire and Crispin. One of our handmade wreaths. 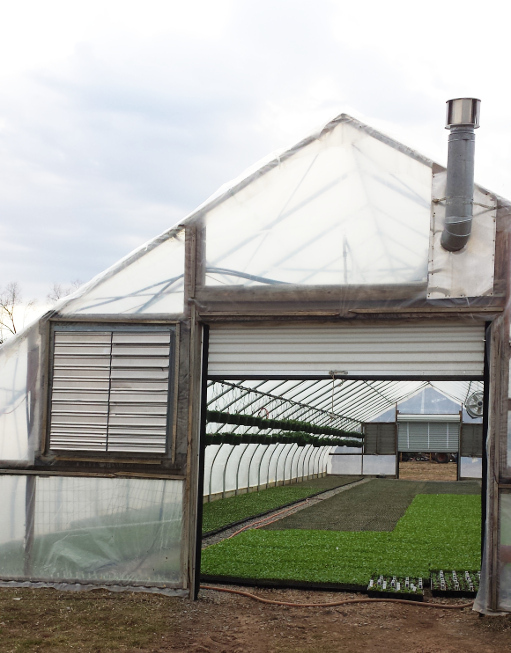 We harvest most of our own greens, including boxwood, holly, fir, pine, dogwood, and rosehips. 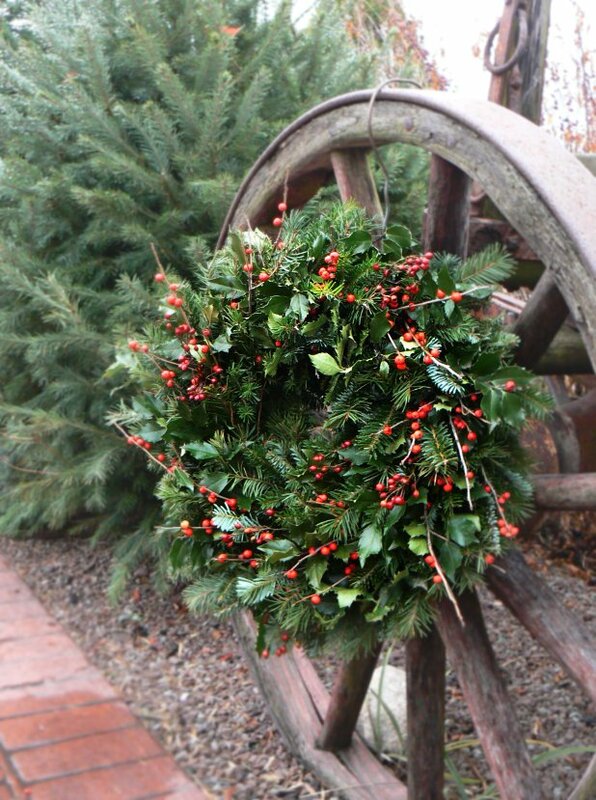 This is a ten inch wreath that also includes Ilex berries. 4.5" Poinsettias in pink, marble, and white. Other colors available include red, white, and varigated red and white 'jinglebells'. We also have 6.5" and 8" in all of these colors. A beautifully varigated red and white poinsettia called 'Jinglebells', in a 6.5" pot. A 10" poinsettia in red. The greenhouse at Kirby's is a beautiful place to visit in Decemeber, with gorgeous, brilliant color from wall to wall. The Peak of Harvest Season! Below is a listing of everything available from the fields and orchards at Kirby's Farm Market for the end of September and early October! Call to place orders for large quantities (585)637-2600. 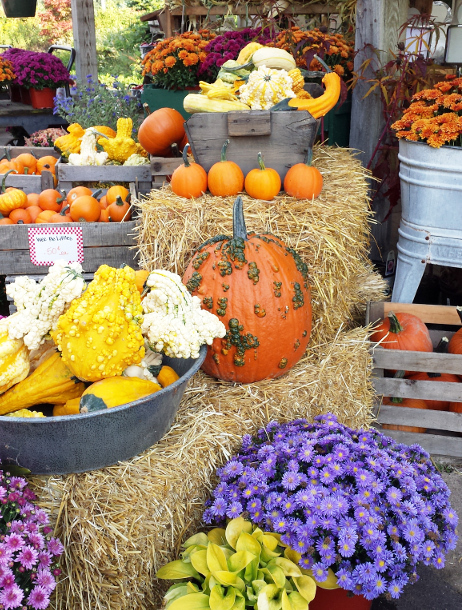 Decorate for Fall: Little white and orange Pumpkins, Gourds, Pie Pumpkins, tons of beautiful Mums, and Straw Bales. 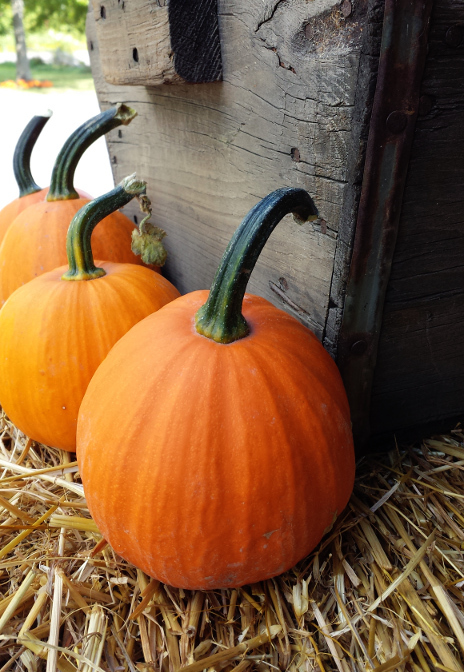 Soon to come: cornstalks and a fun variety of big pumpkins! The weather right now couldn't be better for canning. Spend a few hours in a steamy kitchen with baskets of gorgeous fruits and vegetables, putting them up for the coming winter, and you will relish every cool breeze. But you'll relish the satisfaction of putting up your own fruits and vegetables for a delicious and healthy winter even more! Some of the most popular things to put up this time of year: stewed tomatoes, tomato sauce, tomato juice, canned peaches, canned pears, peach jam, applesauce, and apple butter. Every family has their own traditions. Last week the Kirby family canned tomatoes and peaches, this week we're making salsa! What preserving traditions do you have? Freezing produce instead of canning is a great alternative. Quick, easy and definitely less steamy! You can freeze just about anything, but peaches, tomatoes, peppers, sweet corn, and sauces work wonderfully. 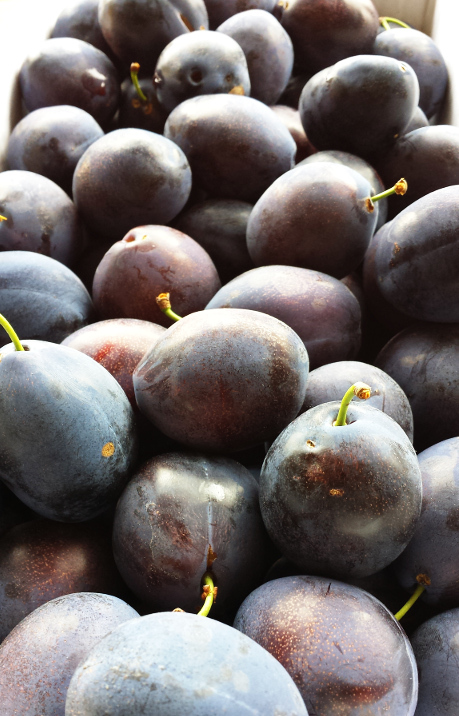 Follow this link to read tons of great information on preserving, canning and freezing fruits and vegetables form the experts at Cornell Cooperative Extension. They have fantastically comprehensive lists that will inspire you to make the most of the fresh fruits and vegetables so unique to WNY! The Echinacea (Coneflower) at the market is putting on quite a show right now! These tough, enthusiastic plants are easy to grow in most gardens. 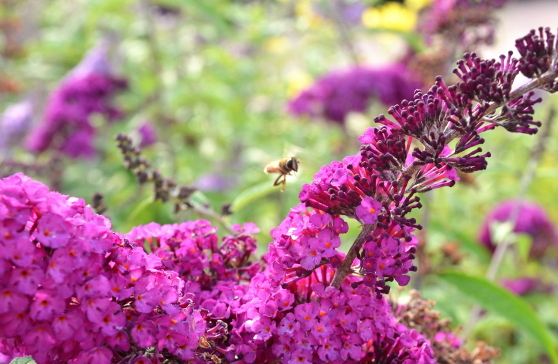 Stop by and enjoy all the summer color in our perennial area and display gardens! "Echinacea has been around for a long time (North American Plains Indians used it for a variety of medicinal purposes. They learned about it by watching injured or sick elk that sought out the plant!) and is a plant that is shared between many gardeners. "It is always fun to see where it wants to be in your garden. You may have planted it in one garden the year before and have found it chose a new location the following year, maybe with the help of a winged friend. You can find a large array of Echinaceas from purpurea to newer varieties like 'Hot Papaya'. They are all striking and provide a food source for butterflies when they are in bloom and for birds when they have gone to seed." In 1998, the Perennial Plant Association chose Echinacea purpurea "Magnus" as the perennial of the year. Echinaceas are considered deer resistant. Echinacea makes a great cut flower for bouquets, lasting up to two weeks in a vase. The spiky brown seedheads are also great for dried arrangements. Echinacea is well known for it's medicinal benefits. For a scientific look, go here. We carry 16 different kinds of Echinacea at Kirby's: Echinacea purpurea; 'After Midnight'; 'Double Decker'; 'Fatal Attraction'; 'Fragrant Angel'; 'Green Envy'; 'Green Jewel'; 'Hot Papaya'; 'Magnus'; 'Pink Double Delight'; 'Ruby Giant'; 'Ruby Star';'Virgin', 'Big Sky', 'Sombrero Hot Pink', and 'Sunrise'. There is a color and a style for everyone!